At La Canada Dental, our priority is to deliver quality care as well as educating and informing our patients in a comfortable and convenient setting. When you have dental problems, you need to turn to a dentist who listens and responds ... an experienced doctor who knows the field and can effectively diagnose and treat your needs ... a friendly physician who counsels you on the best ways to maintain and improve your health. Our dentist meets all these criteria. Plus, you benefit from a dedicated team of trained professionals who give you the individualized attention you deserve. La Canada Dental believes that informed patients are better prepared to make decisions regarding their health and well being. Our office educates our patients about dental hygeine, diagnosis, treatment options, and the long term health and benefits of the treatment plan; as well as the decision to wait on treatment. We believe that a well informed patient will be able to make a decision with confidence. Our office has included an extensive section on this web site covering the full array of topics associated with dentistry and dental diagnoses and treatments. We encourage you to look through these pages whenever you have an interest or concern about your dental needs and care. Our Lobby is pleasent and relaxing. We make available to our patients eduational materials, the most current magazines, refreshing beverages and simple comforts of home. Our front office staff has over 20 years of dental experience and is up to date on the advances in dentistry. They are always ready to answer your questions and help with scheduling and communication via e-mail or text. We are the only office in the city that you are guarenteed to reach a staff member 24 hours a day. No answering service for us; we consider our patients family and are always available for your dental concerns. Our dental operatories are fully equipped with state of the art equipment including the latest in digital x-ray technology. Digital x-rays offer a detailed image of your entire mouth and also offer up to 90% less radation than traditional film x-rays. Our The best care in the world does not mean anything if you cannot access it. 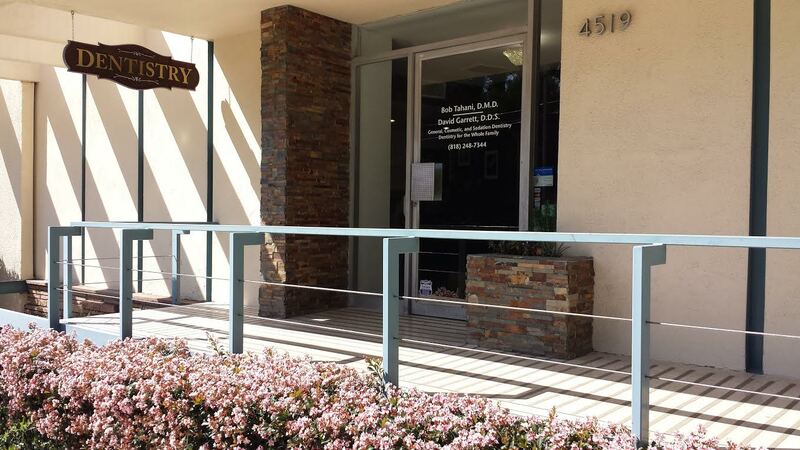 At La Canada Dental Group, we strive to make our La Canada office as efficient and convenient as possible. Included in these web pages is information about La Canada Dental Group's office, including our La Canada location, maps, directions, hours, insurance policies and appointment scheduling. You can even email a request for an appointment right here! Robert Tahani, DMD is a graduate of Boston University School of Dental Medicine. Dr. Tahani, also known as "Dr. Bob," is well-trained in all aspects of dentistry from general, cosmetic, endodontics, to full mouth reconstruction. Dr. David Garrett has been practicing dentistry for over 40 years and is a graduate of Northwestern University School of Dentistry.